To be an environmentally friendly business specializing in the production of fresh water trout used to provide a positive family fishing experience at our facility, as well as provide a variety of healthy trout for stocking your private or public waters. Dino and Roberta Giannola purchased the Watersmeet Trout Hatchery in February 2007. Dino is a Michigan native who attended Michigan Tech University. He has spent the last 25 years in Texas and recently retired from firefighting after 24 years with the City of Arlington, Texas. Dino is an avid outdoors man who was taught to appreciate and enjoy the beauty of the outdoors by his father. Roberta spent the majority of her childhood years in Michigan. She moved to Michigan in her early teens and attended Wayne State University before moving to Texas with Dino in 1982. Roberta was raised to appreciate the outdoors as well. Robert has worked as an office manager as well as managing a pizzeria with Dino. Dino, Roberta and their three children - Anthony, Amanda and Amber - plan to make the hatchery a "family operation." 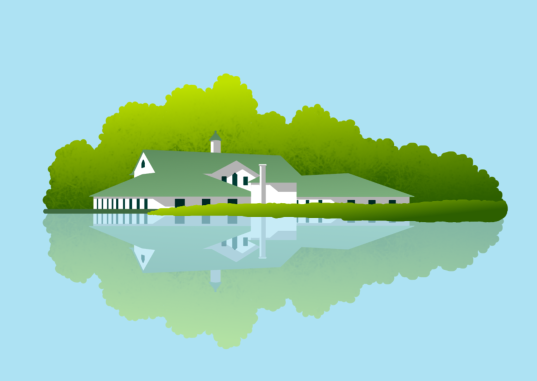 The Watersmeet Trout Hatchery was built by the State of Michigan in the early 1930's. It was operated by the state to provide trout for public waters in the Upper Peninsula. The hatchery building itself is 9000 sq. ft. with 17 concrete tanks that are 4.5' x 17'. In the upstairs of the hatchery, the state provided a living quarters for the workers that operated the hatchery. This living quarters is finished in knotty pine and provided three bedrooms, a living room, dining nook, bath and kitchen for workers. In 1965 the state moved their operations and the hatchery was idle until 1970. 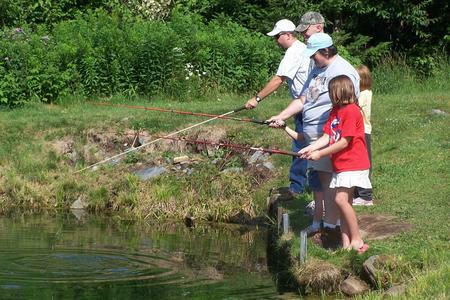 In 1970 Bob and Barb Tieman purchased the hatchery as a private business open to the public for family fishing and pond stocking. They transformed the facility and developed an attraction that has in excess of 4000 tourists a year! They also built a reputation of providing quality fish for pond stocking throughout the Upper Peninsula. The Tieman's made numerous improvements to the hatchery building as well as adding more outdoor ponds during their 36 years of ownership. In 2007, Watersmeet Trout Hatchery was purchased by The Giannola family. Dino and Roberta plan to continue building on what the Tiemans started back in 1970. Our goal is to provide a pleasant and fun experience for families that visit us! As well as provide quality service and fish for private and public waters throughout the Upper Peninsula and Northeast Wisconsin.